Please contact us to order wholesale today! You can also find by visiting us at our farm store. If you are not “in the biz” of food please ask your favorite grocer to contact us. We also welcome orders for wheels of this cheese from anyone out there so click the link about wholesale above if that’s your style. This is a lovely smooth Gouda Cheese that makes me think “slow and steady”. Both the cow and sheep versions are simple and elegant. 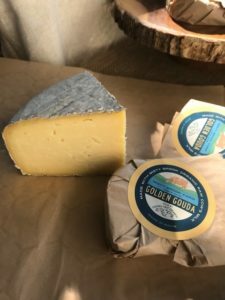 The subtle flavors are sure to win over any cheese lover, and this is likely a wonderful pairing with a peppery cracker or hot pepper jam for those interested in adding flavor to the experience of the cheese. This would also go well with flavors like a hard cider. 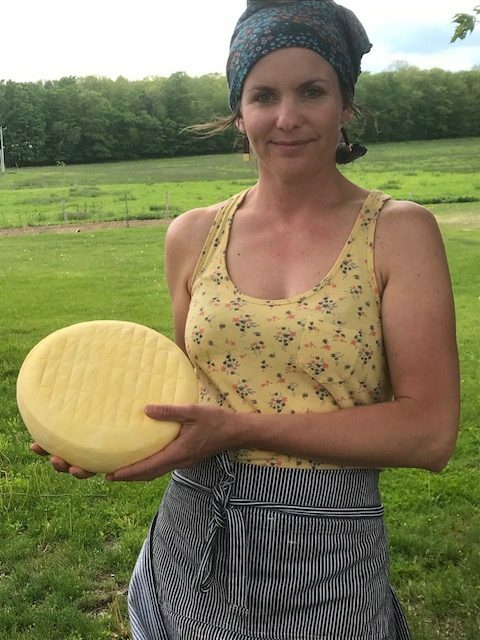 We partnered with Crooked Face Creamery on this product because we love Amy’s style and love that goes in to her work. She uses her instinct and fermentation knowledge to bring our organic, soy-free milk to life in a whole new way. We love this elegant product she has created. This entry was posted in Products on September 18, 2018 by Jeremy Bloom.